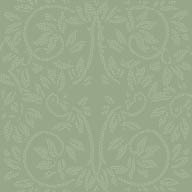 Who wants to be wearing a heavy wool come spring? "Not I", said the sheep. 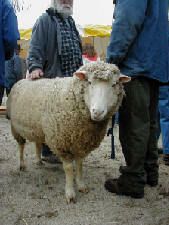 Early in the morning the sheep begin arriving at the Denmark Arts Center for their yearly shearing. The pens are waiting. So is the shearer, his clippers all oiled and ready. The trucks arrive and each sheep is led to a pen. For some it is the only time they leave their home and familiar surroundings. Soon the pens are full and there is a waiting line of trucks and trailers filled with sheep. The air is filled with the sound of sheep on the move. Some of them are new mothers with their lambs alongside. Surely there is no sound in the country that says "spring" like the baaing on little lambs. Some sheep are very patient, others a bit ill at ease as they look around them at sheep they have never met, a place they don't remember and people they don't know. 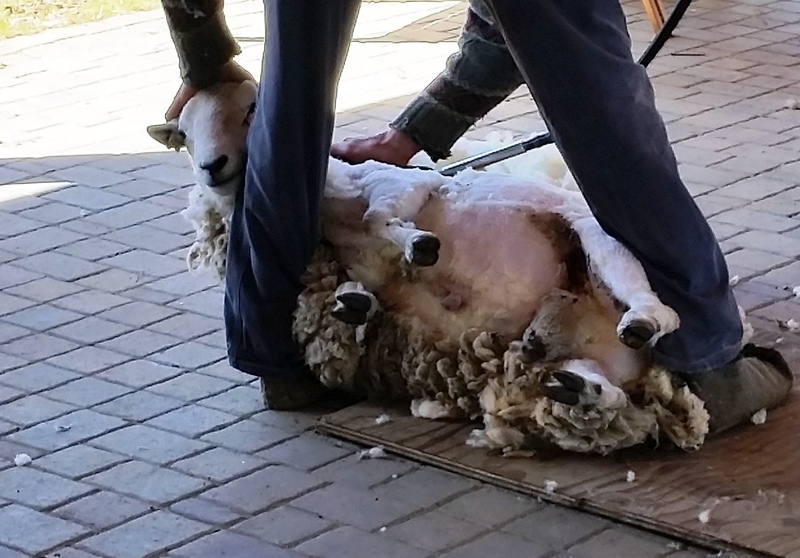 Soon the first sheep is led to the platform and the shearer with a quick twist gets the woolly sheep into position and makes the first path with the shears from the chin down the length of the belly, one smooth motion. As the fleece falls to the side he makes another long pass. 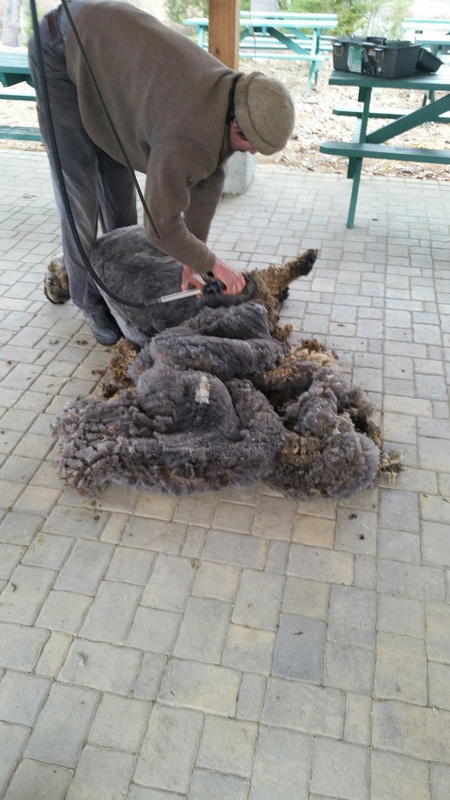 This belly wool is usually discarded as it can be matted and full of hay, and is cleared from the platform. The wool on the legs is sheared and cleared away, too, and the work of shearing the best part of the fleece begins. Moving along at skin level the shearer deftly follows the contours of the body in long sweeping passes. 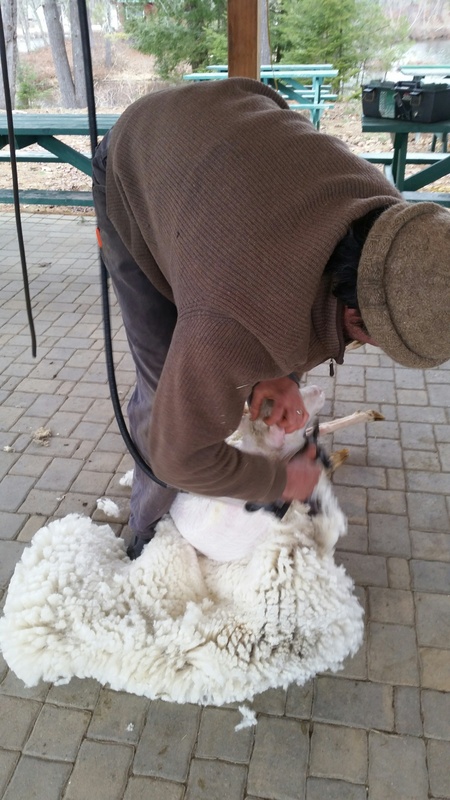 He shifts the sheep's body as he finishes one side and begins to work along the back and the second side. Soon half the wool is sheared. Down the back slide the shears and the fleece falls away from the sheep. It is loose but hangs together like one large blanket. Before you can whistle "Dixie" the shearer is making the finishing passes to complete the process and the sheep moves on to have its hooves trimmed. 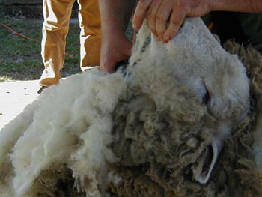 Lots of people want to know if it hurts the sheep to have its fleece sheared - no more than having a haircut hurts. 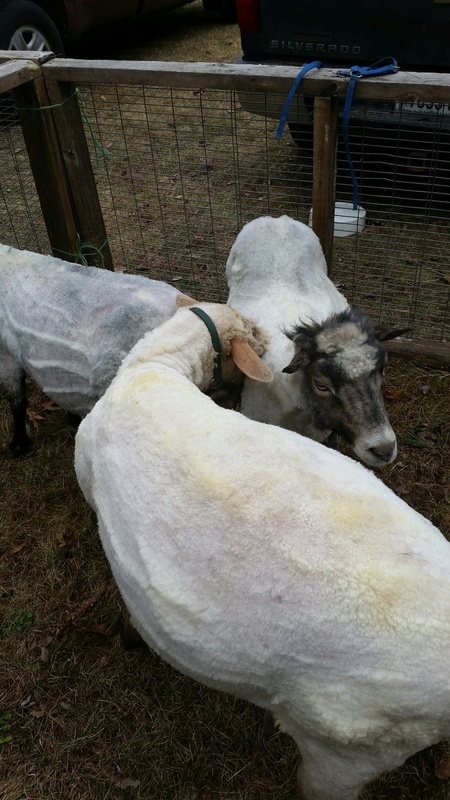 Actually the annual shearing of the wool makes a sheep feel good. They have carried that fleece all winter. 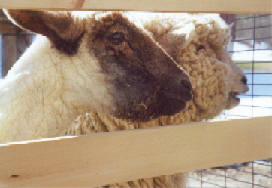 Different breeds of sheep produce different kinds of fleece. 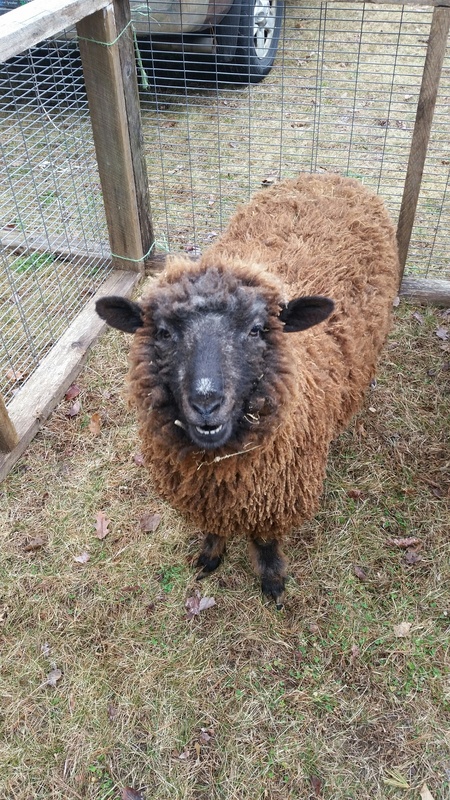 Small breeds produce a fleece of a few pounds where a larger breed of sheep can produce a fleece weighing over twelve pounds. Natural oils, lanolin and soil make up some of that weight. When washed and dried the fleece will weigh a good bit less. 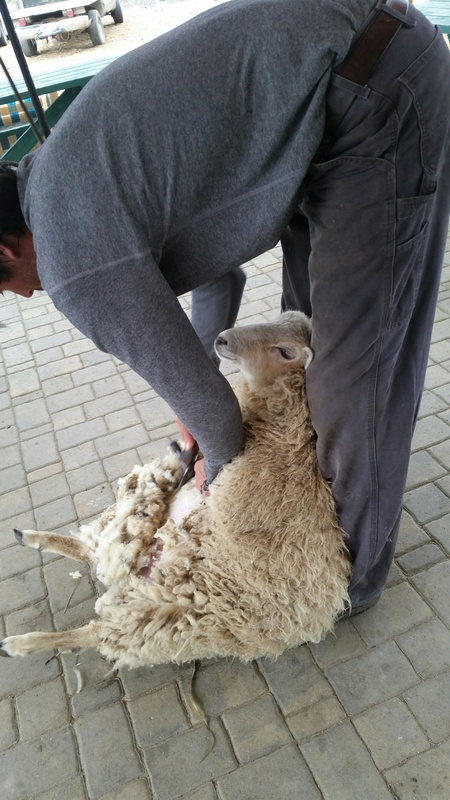 Hoof clipping is part of good sheep hygiene and helps keep the sheep's feet healthy. Each hoof has a pair of pads surrounded by a hard, horny material similar to our fingernails but much tougher. This grows and protects the pads but does need to be trimmed now and then to keep the feet comfortable and in good shape. 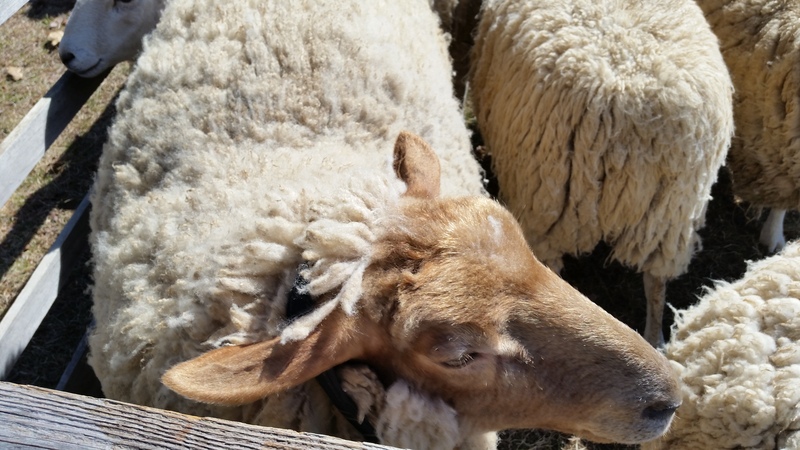 Once the fleece has been sheared and the hooves have been clipped a sheep is ready to go home or returned to the pen while its companions take their turn with the shearer. Go to Skirting to see what happens to the fleece after it is sheared. 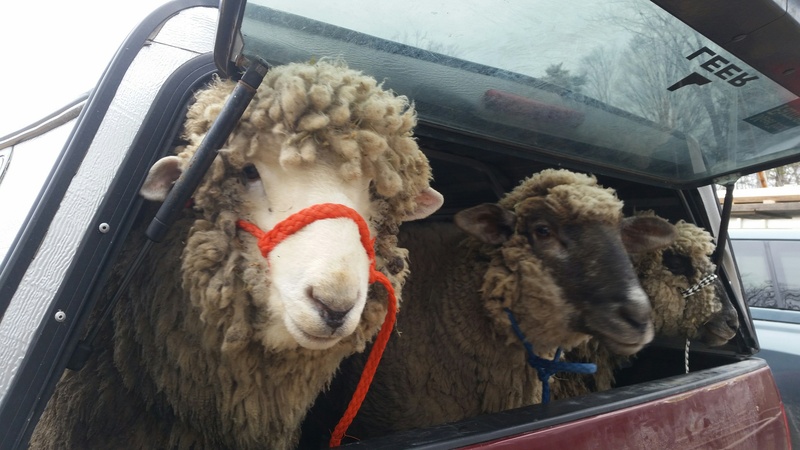 Be sure to read more about what happens at the Sheepfest!